PLENTY OF FREE PARKING LOTS! JUST TWO MINUTES FROM THE TRI-RAIL STATION. ADVANCE TICKET SALES HAVE NOW ENDED. PLEASE BUY TICKETS AT THE DOOR! MORE ART! MORE MUSIC! MORE FOOD! MORE HOURS! SAME LOW PRICE! Advance Ticket Sales End at 2:00pm on Tuesday. Proceeds go to support the local arts. 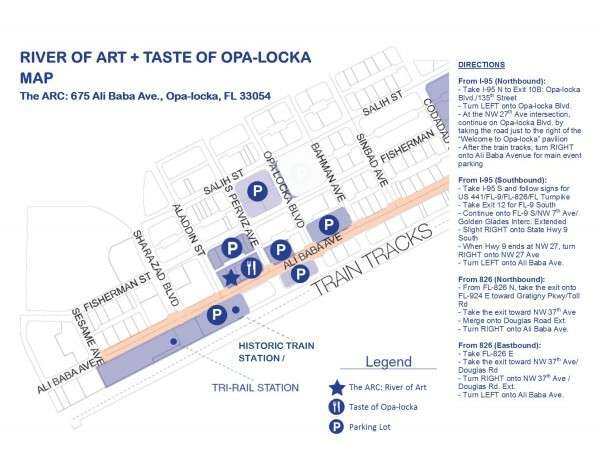 Hosted at the brand new Opa-locka Arts and Recreation Center, we have teamed up with the Opa-locka CDC and Buskerfest to produce our biggest River Of Art, yet! 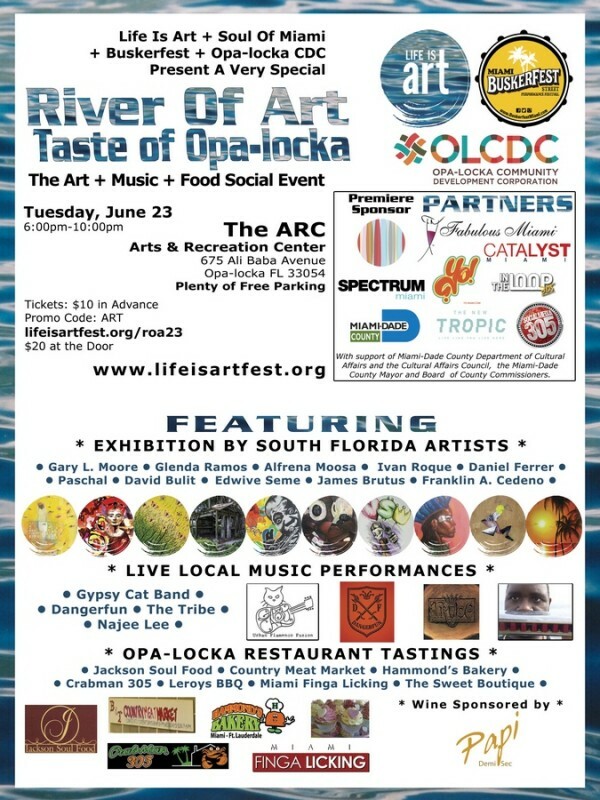 Featuring ten amazing local artists, a showcase of hot local bands and performers, and tastings by several Opa-locka restaurants, we guarantee this will be worth the drive. 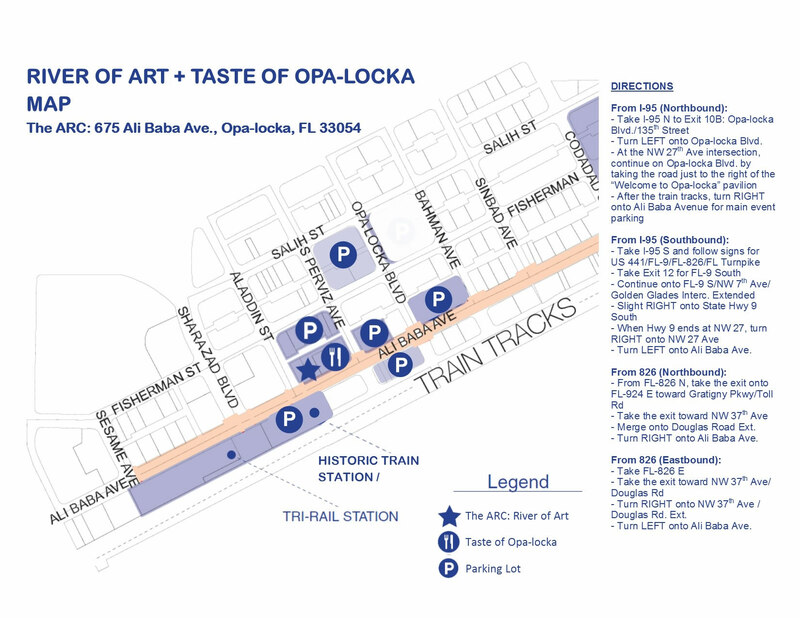 Entry includes complimentary tastings from Opa-locka restaurants and wine tasting sponsored by Papi Demi Sec. The River Of Art is an exciting evening of business networking featuring an interesting show, excellent music, delicious cuisine tastings and refreshing beverages. The River Of Art is a monthly gathering place of Miamiâ€™s good people, executives, industrialists, innovators, creators, entrepreneurs, changemakers, activists, and artists. Attendees may enjoy a complimentary welcome beer and tastings of the menu included with your entry. Musical act world music fusion. Gypsy Cat Band is a group of world class artists who integrate the sights and sounds of flamenco with rock, jazz, blues and Latin music. The Dangerfun Sideshow entertains all occasions with music, stunts, and outrageous acts. Comedic juggling, magic shows, burlesque performances, and contortionists are common place at a Dangerfun event. This rock n roll circus sideshow is based out of Miami, Fl but serves the greater South Florida area. Dare to have fun with the Dangerfun Sideshow! The Tribe explodes with with rhythms from around the world, and dancers entice everyone to join the celebration. For over ten years, The Tribe has entertained audiences on three continents – from intimate night clubs to large concerts and festivals. With a vast collection of authentic percussion instruments, audiences marvel at The Tribe’s mastery of rhythm. Born December of 1991, Ivan J. Roque is an urban artist from Miami, Florida. Raised in the inner city of the infamous Carol City has always had a passion for art, hip hop, and culture alike. His influences range from both old masters such as Marcel DuChamp , Jean Michel Basquiat, and Mark Rothko to the geniuses of today such as Justin Bua, Shepard Fairey, Anthony Lister and Typoe. Roque has been able to accomplish many achievements for his young age, such as working with the rap group sensation RVIDXR KLVN and showcasing alongside established artists such as Stephen Gamson, David Detuna and Ruben Ubiera, he was also chosen to be a part of the acclaimed Pop Up Pianos Miami during Art Basel and a commission piece by the Town of Surfside. Also not to mention he has had already two solo shows and his pieces are picking up much demand with shows across the country and works being sold to collectors worldwide! His work is extremely fresh and something to really be looking onto as we begin to see what can come of those who are forever lost. I am a local artist, originally raised in Miami, Fl. I attended Miami Dade College and earned an Associates in Arts/Art Education. I also graduated from The Art Institute of Fort Lauderdale in 2007 with a Bachelors Degree of Industrial Design. I currently leave in Broward and work on some freelance Graphic Design and Industrial Design projects. I also do oil paintings and photography during my free time. I have recently been participating in local art walks and at the same time I’m looking for new opportunities to be more involved in fine art events as I would like to expose more my artistic talents. The images that I used were spiritually inspired by my love for music, color and God. My goal is to embrace all of my mistakes and turn them into a creative narrative. There are so many things that one can create by using color, lines and figures. Within this body of work one will find multiple techniques being used. Some are blind contour drawings, the illusion of textures, different colors in specific areas, abstraction and so much more. I want to portray just what you see at this very moment and that is the definition of me. Gary L. Moore (born PeeDee, South Carolina, 1954 and raised in Philadelphia, Pa), is an artist designer based in South Florida since 1989. He designed the multi-dimensional public artworks Wind Through Four Points, West Palm Beach; Yesterdays Tomorrow, Phila, PA, Pharoahâ€™s Dance Plaza and The Ninth Street Pedestrian Mall, both in Miami, Florida. He has exhibited at the Museum of Art, Fort Lauderdale, Fl, Institute of Contemporary Arts, Philadelphia, Intermedia Arts, Minneapolis, Minn. Moore attended the University of Miami on full sculpture scholarship, obtained an MFA from Vermont College, and is graduate Fellow of the Whitney Museum of American Art ISP Program 91-92 and is currently Artist-in-Residence at the Opa- Locka Community Development Corporation in Miami, FL. He has taught large scale art installations at Miami Dade College, New World School of the Arts, Miami, FL and the Miami International University of Arts and Design. James Brutus an emerging and promising artist went head first into the art scene. Jamesâ€™ body of work focuses primarily on painting and portraiture where his reputation of powerful figures balance between both meticulous brush strokes and dynamic loose energy. These figurative pieces question the social notion of nature and beauty; thus the age-old human longing for perfection. James earned his B.F.A. Degree at the College for Creative Studies, Detroit, Michigan. There his focus geared towards Illustration and Fine Art. At this time, he is working with inks, acrylics, oils, and digital as such repeatedly changing his portfolio targeting more portraits and illustration assignments. James has created illustration for newspapers and magazines; such work has been seen in Michigan View, Chicago Tribune, among others, as well as for private clients. He also exhibited several of his work in galleries throughout Detroit and Chicago. In late 2009, James announced his arrival back to his thriving, highly respected art scene, and hometown, Miami, FL (where real oranges grow). He hopes to modestly continue participation with group shows, commissions, and freelance projects. Clouds n Roses, Introducing Paschal, I aspire to inspire those before and after me using gifts I am blessed with. I understand this life we live is purposeful and it is my purpose to reveal unto others what they cannot see within themselves. Through my journey of discovery, Iâ€™ve found the best way to do so is through my natural ability. What I do is for you (the seeker) it is a gift from me (the visionary) we are all kings and queens with minds of gold and tender hearts and sometimes cannot see the power we hold due to weary eyes. If we look into ourselves in search of the power within the difference weâ€™d make is endless. Be true unto you because it is he who put truth intoâ€¦is what led me to who I am becoming. Change what a difference could make if we believe in who we are and what we could become. My vision and my mission exceeds the material things I create, my dream is to help people DARE (dreams are reality eventually) to dream something Iâ€™ve told myself since the sensitive age of sixteen. If I could change the world with creations of mine my dream would too become reality. I want to question the world as we know it through my artworks. I always try to focus as much on the subject matter as the quality in my works. When I draw/ paint, I involve myself in the process as much as possible, so that I can become connected to everything I create; in a way each piece of art is a piece of me. I believe this is one of the best ways to create because having a connection to my creations brings out a certain passion, which can be seen in the final product. My ultimate goal in the final product of my artworks is to provide visual pleasure, mental turbulence and questioning, and emotional connection. Letâ€™s question the world together, shall we? My name is Daniel Ferrer. I’m a 22 year old multi-disciplined visual artist. I can’t tie myself to one medium because I’m in a constant mode of experimentation, which I believe is essential to being an artist. I’m inspired by socio-political issues, environmentalism and experiences with nature and vast landscapes. Glenda was born in Brazil but has been in Miami since 1997. Her passion for painting started in 2013 and it came as a pleasant surprise. Nature and abstract paintings with vibrant colors are sure to make you smile. I was born and raised in South Florida and have lived here since. I began urban exploring in 2009 after watching a documentary about it and becoming interested in the history people had left behind. My love for photography grew from it as a way to share these places with others. My website was started as a personal means to share my work online. Working together with other explorers and photographers in the state, the website has grown into what it is today. Started in 2010, Abandoned Florida looks to document abandoned and forgotten places throughout the state of Florida as well as promoting and sharing the work of local artists, photographers and film makers with similar interests. Since 1946 Jackson Soul Food Restaurant has served the Overtown Community, and visitors and residents of Miami Dade County Serving up traditional Soul Food culinary delight such as their famous catfish. With just a small capital pioneer Jessie E. Jackson and Demas Jackson, husband and wife, lease a 500 square foot property at 1333 NW 2 Avenue from Johns Missionary Baptist Church to open Jackson. Through the years, Overtown has experienced challenges that threatens to dampens the congenial spirits of residents, but the community has emerge stronger and Jackson soul Food Restaurant has been there through it all providing comfort through its soul food. With time, love, commitment, quality food offerings and dedication to loyal customer service, Jessie and Demas cultivated Jackson into a first class establishment. Welcome to south florida’s destination for flavorful seafood. Where we specialize in all things from the sea from conch, lobster and shrimp to our customer favorite, garlic crab legs. Stop in today and experience “seafood hospitality” crabman 305’s way! The restaurant is a collaboration between Miami music mogul Elric Prince of Poe Boy Music Group and chef Latosia Colton. The restaurant is spearheaded by Poe Boyâ€™s E-Class and takes over the historic Royal Castle location on 441 and NW 125th Street. The new restaurant is a mix of soul food and Caribbean food. This is the second location for Finga Lickin with the first and original location located on NW 62nd Street. The Sweet Boutique is a made to order specialty bakery in business since 2008. We offer free hand delivery in the New Smyrna, Edgewater, and Oak Hill area as well as special deliveries in the surrounding area. We have over 22 years experience producing wedding cakes, birthday cakes, and novelty cakes and a variety of pastries, muffins, quick breads and cookies. We are the only bakery that allows you to determine the product, whether itâ•’s a diabetic recipe or a family one from generations past. We use only quality ingredients creating our products from scratch! Stop in to pick from our daily selections or special-order whatever treat you desire! The Opa-locka Community Development Corporation (OLCDC) was established in November 1980 as a non-profit community development corporation to address the distressed unemployment conditions, particularly in the Opa-locka and North Dade County, Florida, communities. It began addressing conditions through community organizing and soon expanded to provide community services and develop housing. Over time, tackling the area’s lack of affordable housing became OLCDC’s major focus. Since 1980, OLCDC has developed and sold 145 single-family homes to low-to-moderate-income first-time homebuyers and, through partnerships with private developers, has built over 2500 units of rental housing. Buskerfest Miami is a collaborative organization dedicated to improving civic life through public street performance. We strive for a connected, thriving urban core where the streets of Miami are active and enlivened with local performers, enjoyed by people of all ages and walks of life. We envision a joyous place that is reflective of the tropical urban landscape and attractive to locals and visitors alike.